Yes, almost by circumstance I decided to relive one of my favorite 80’s songs, Murray Heads’s “One Night in Bangkok”. Our chess match involved all the the intricacies and intelligence of maneuvering around the world and the reward was a day to enjoy Thai food. Of all places to have a one-day layover, Bangkok is a delicious place to be stuck with twenty-four hours to burn. The epicenter of Thai food is guaranteed to tantalize with vibrant flavors and leave the mouth panting for more while the stomach pleads for it all to stop. Thus, as expected, we spent our last day in Thailand eating, walking and eating a bit more and fulfilling everything that 4feet2mouths can be. The challenge of securing a Chinese visa is that proof-of-entrance and exit is required. Thus, six months ago we took a stab-in-the-dark and booked a flight to Kunming from Bangkok. In hindsight it would have been slightly easier and cheaper to just bus over from Northern Laos, but we would have had to fake a flight at the Chinese Consulate in San Francisco. 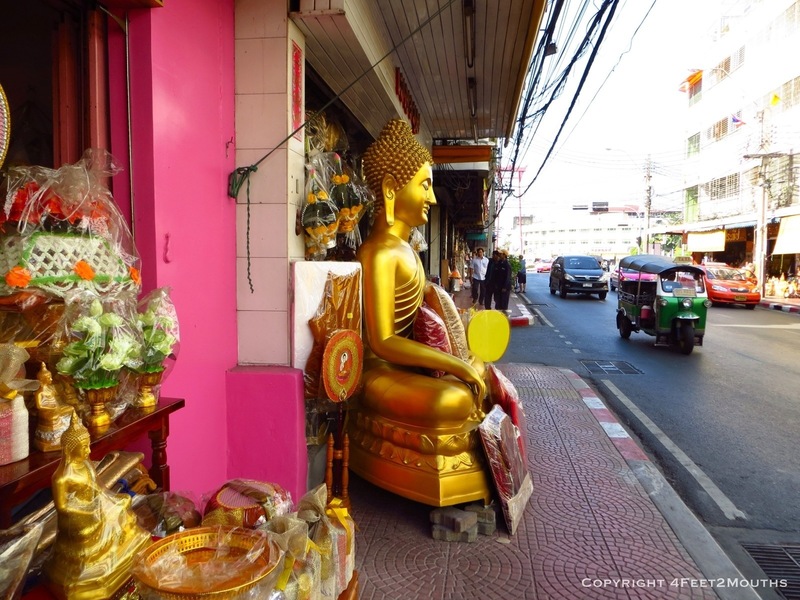 Thus When we finally returned to Thailand, it felt very natural, and it was welcoming and exciting to be in a place that we had explored and enjoyed six weeks ago. Within 10 minutes of our hotel we were graced by a hundred Buddhas that were humbly meditating the streets and awaiting to be purchased and set into future Thai temples. There was really one destination that we had in mind, Thanon Dinson. This two block street is all that you need to know for excellent Thai food. There is everything from noodles, barbecue, soups and rice dishes; and everything is excellent. Our first place was Krua Apsorn. 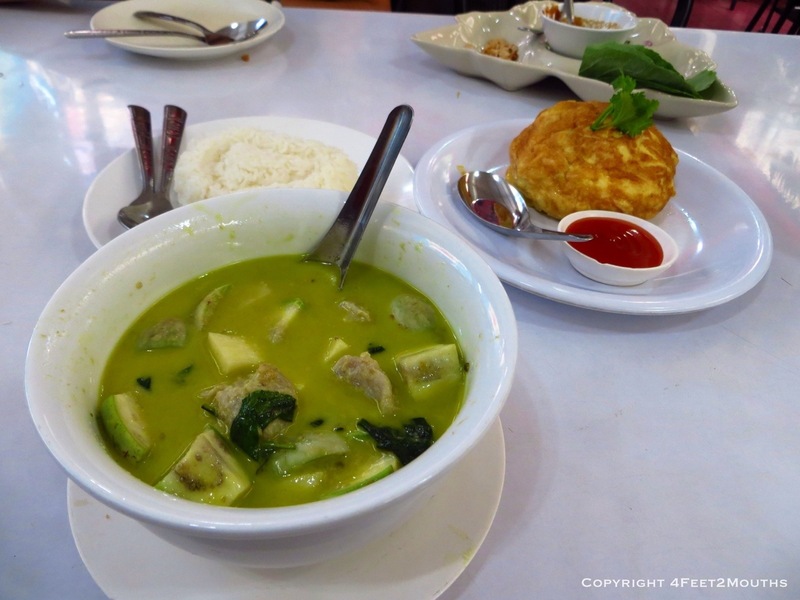 this mid-range restaurant serves mostly central Thai cuisine of very high quality. We ordered a fish ball and baby eggplant green curry and crab soufflé. 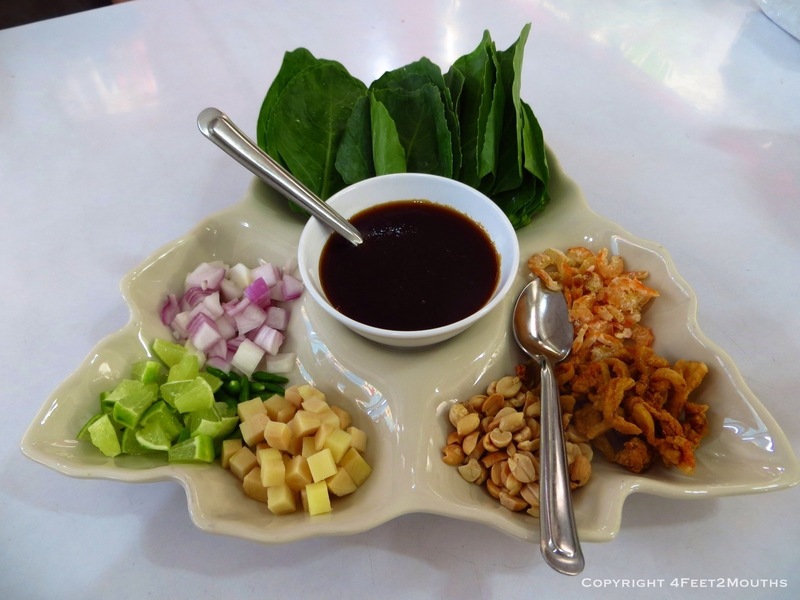 The star of the restaurant was the extremely simple and fresh appetizer called miang khanna. A platter arrived with lime wedges, ginger, chopped onion, peanuts, pork cracklings, dried shrimp, betel leaves and a tamarind sauce. We rolled up some of everything and took a bite that exploded with textures and flavors. We will definitely be recreating this one at home! Literally across the street and to the right a little bit is a delicious spot for boat noodles. This is the birth place of our “dirty noodles” concept that the best soup shops are fast, cheap, and deserve with people. They pulled a couple bowls off the stack and added the noodle thickness of our choice. It was up to us to make it special with some added chili, vinegar and a dash of sugar. We crossed the street again I and enjoyed the serene canal. It was a really warm, but peaceful day. We could not expect anything better on our last day in Thailand. 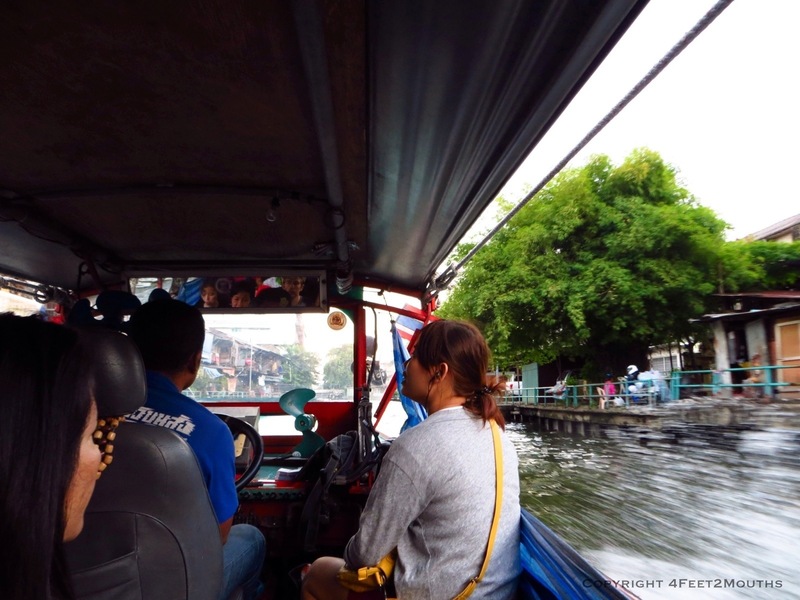 The Klong San Sap canal boat public transit in Bangkok is wonderful. 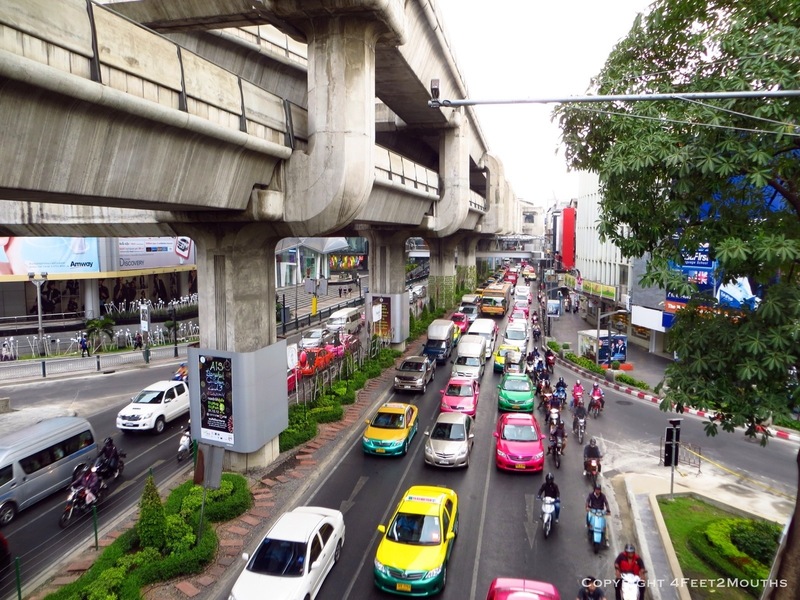 There is an elevated rail and plently of colorful taxies, but the canal system is the more fun way to get around. We did not get to experience this on our first trip. But this time we conveniently found ourselves making trips from Old town to near the MBK mall. We loaded onto the thirty person boat and it roared down the twenty foot wide canal. At first I wondered why the ticket operator was wearing a helmet, then suddenly the whole roof of the boat collapsed swiftly to clear the bridge ahead. They had actually designed the boat so that the roof was hinged to drop the height three feet and at these brief moments the driver maneuvered the boat peering through the three inches of visible windshield. We gripped our seat for the first few times, but ultimately the experience proved enjoyable and entertaining. 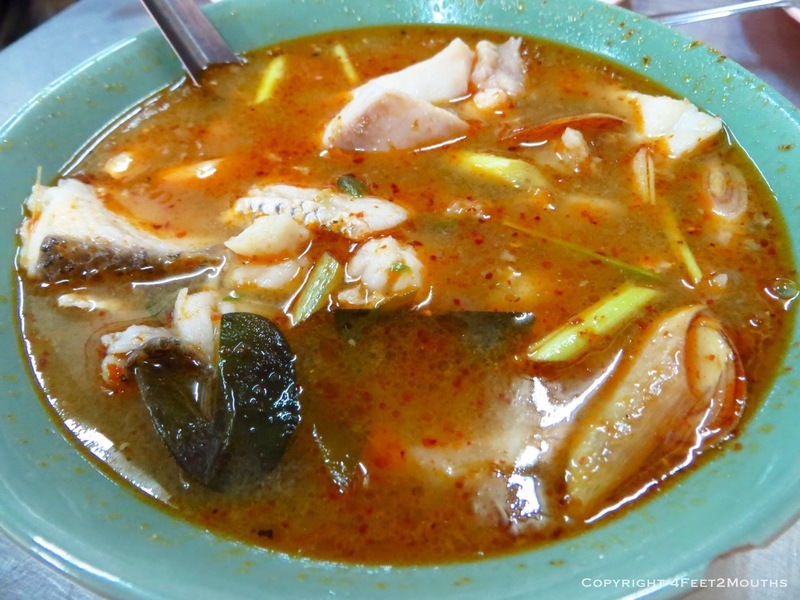 The must-visit Thanon Mahannop fish soup shop. Can you imagine the anxiety of eating your last Thai meal? What if you knew you could not have Thai food for eight weeks? Funny, yes, but we took this very serious. Our final morning in Bangkok was spent roaming the streets for something that might sustain our memory of Thai cuisine. We scoured the streets to find something that would be sour, spicy, sweet, salty and savory. Our first thought was the fabulous pad thai at Thip Sanai on 313 Thanon Mahachai, but it was closed! Thus, we drifted to our trusty Thanon Dinso. What we discovered was one of the best meals of all Thailand. We peered up a side street called Thanon Mahannop, just west of Thanon Dinso. We found a small crowd of people outside a tiny restaurant on the south side of the street. We snagged a table and pointed for two bowls of what everyone else was having…some sort of stew. 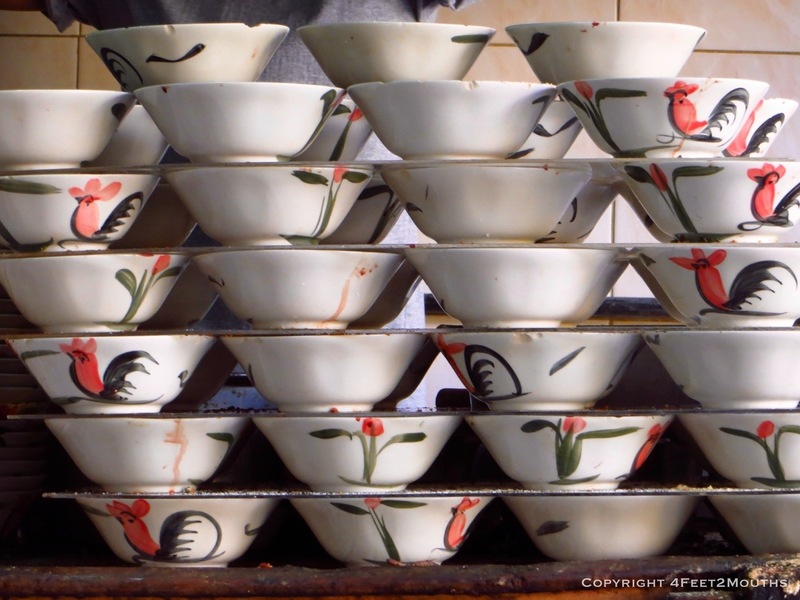 The bowls arrived with a red broth packed with lemongrass and chunks of fish. This was the most intensely flavored wonderful dish. Any discussion of it and I watch Carmen lick her lips remembering the flavors. The stew was spicy, the fish tender and the sour lemongrass potent. This was an awesome find for our last Thai meal. And just as quick as One Night in Bangkok came into existence, our layover was finished. Backpacks were cinched tight and thrown over our shoulders once more. China, our final frontier, loomed just to the north. The canal reminds me of the Riverwalk in San Antonio, TX. The food looks wonderful in these photos. We have never been to San Antonio, but every conversation about the city always has includes the river walk. 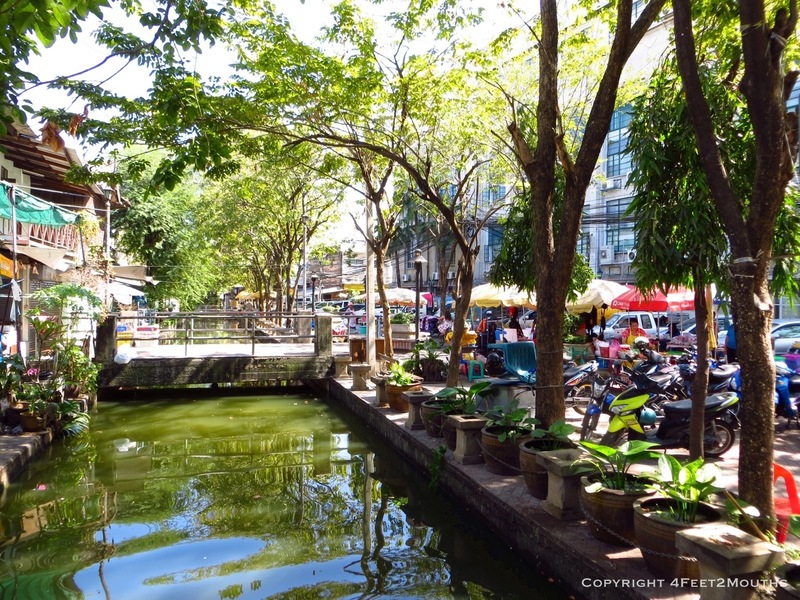 The canals in Bangkok are not that accessible to pedestrians. There are only a handful of spots with boat access and river viewing parks, but they are all nice. That fish soup looks like tom yam. And from the way you desribe it, it sounds like tom yam, too. You should try going to Penang, Malaysia some time. There are little alley restaurants with WONDERFUL food. And the night markets are brilliant. Yes, this definitely Tom yam pla. What was different was that this tom yam did not have coconut in the soup base. We are very excited to go to Penang in the future! Our first trip yo Malaysia was just spent in KL and Malacca. Brilliant! 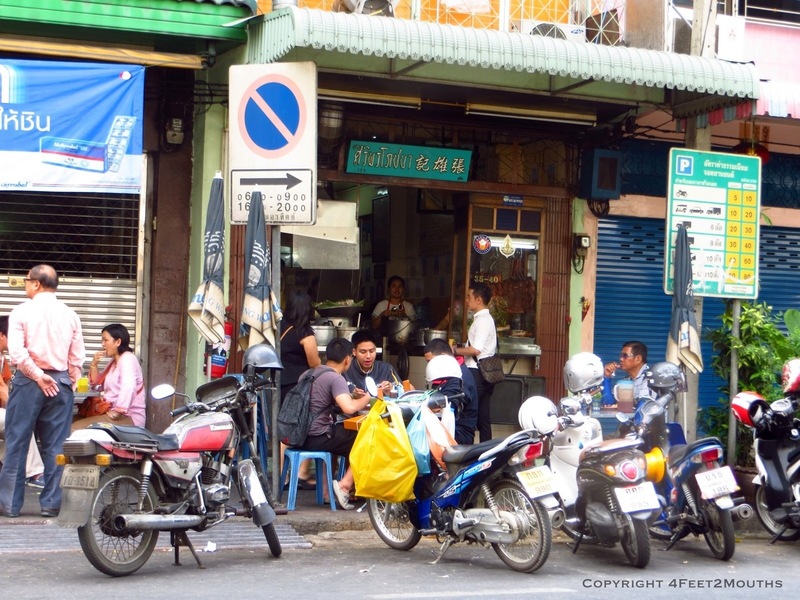 Ipoh, Sungai Bakap, and the area around there are all good places if you want some nice food. In Sungai Bakap, there is a morning market (just ask any vendor for the address) where the food is delicious. My mom and I used to eat there every week. 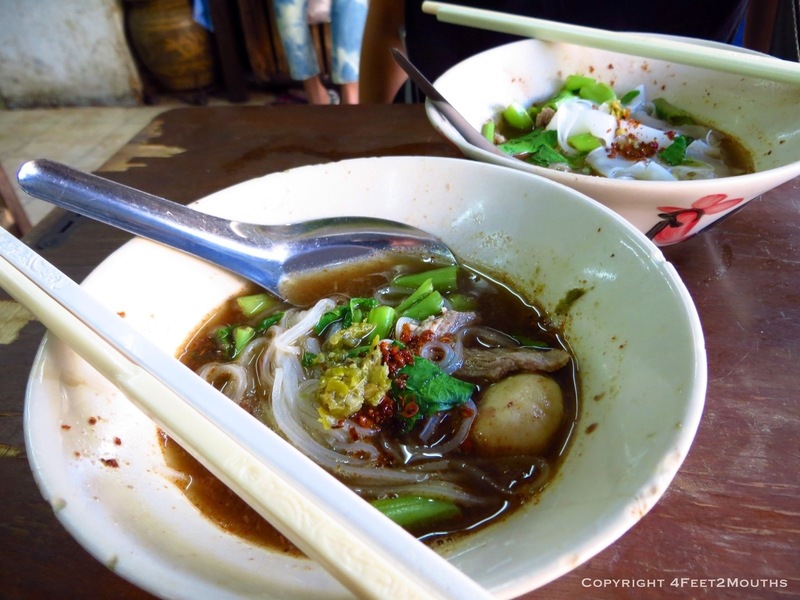 If you’re heading to the market, try the stall with brown sauce noodles.